I could not agree more with the quotes above, Twitter has been a revelation and an eye opener to the many fabulous professional learning opportunities, I did not even know existed 4 months ago….Teach Meets for example!! 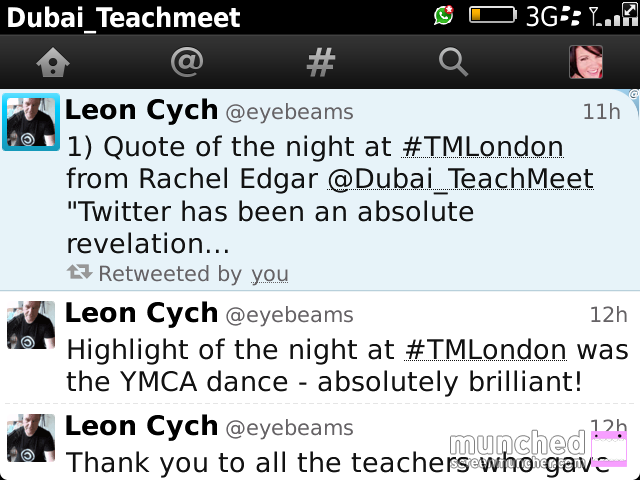 I admit to also being fascinated by the Teachmeet phenomenon, a self confessed CPD geek and magpie, my own Twitter handle @Dubai_Teachmeet was an attempt to set up such CPD events, where I teach in the UAE.. professional development at grass roots level, bottom up, by teachers for teachers, exactly the way it should be! I have always followed the #TMLondon events from afar via using the hashtag and watching the footage and been a little envious at not being able to attend due to current location and then this…. 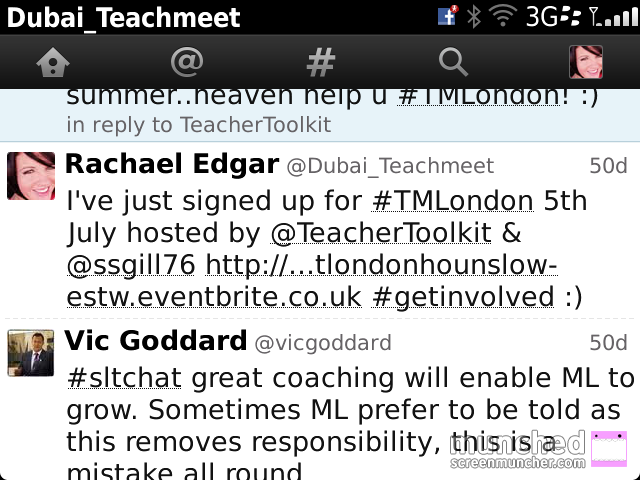 Fortunately our term in Dubai finishes at the end of June which meant I could sign up to attend #TMLondon on the 5th July, a little later one of the hosts contacted me and asked if I fancied doing a presentation and whilst that prospect was a tad daunting, I couldn’t really turn down my 5 mins of fame and the opportunity to see how the Teach Meet professionals do it.. The Heathland School in Hounslow is a great venue, still glistening from their recent Ofsted ‘Outstanding’ grading, the layout was excellent and the sun was shining, providing a perfect backdrop for some high quality professional development..
What followed certainly did not disappoint, it was fast, furious and fabulous! I’m no stranger to presenting but was more nervous than I thought I would be….really glad I did it though, 5 minutes flies by! Below I have summarised what I picked out from each presentation, thank you to the hosts Ross McGill, Sapuran Gill and Mike Rose for an excellent evening. I got some great tips for when my school hosts the UAE’s version of the Teach Meet #SPARKuae on October 26th. We should concentrate on improving the quality of teacher talk rather than reducing it. Four lynchpins, explanation, modelling, asking questions and providing effective oral feedback. Explanation- Sum up the most important information in one sentence, then flesh out with real life examples, analogies or anecdotes, make it stick! Model- Display a list of informal words before you begin talking, use a range of academic words and ask students to listen for them- colour code for difficulty. Questioning- Socratic questions- important way of challenging students thought process. Problem? AS and A2 students lacking confidence when speaking about Chemistry. ‘Find someone who’- Get an answer from everyone in the room. ‘Quiz Quiz Trade’- Q&A on separate pieces of paper, students pair up ask each other the qs, get answers then trade q slips. Rainbow groupings- Students put in a colour to become an expert in a topic, then given a number to share. ‘Leaders of Talk’- Group of 20 year 8 confident speakers trained as ‘Leaders of Talk’. Main aim to work alongside teachers and peers to focus on how talk happens in the classroom. 4 training sessions, once a week for 1hr. Development of a ‘Talk Toolkit’ for both staff and students to use to aid talk for learning. Can traditionally differentiate in a number of ways, give clues, questioning, sentence starters, cloze activities. Biggest problem is how we differentiate on average for 240 students a week. Divide students into expert groups according to ability, home teams are mixed ability who work together in every lesson. Creates competition between teams, given prizes for being at the top of the leader board. 5 whiteboard tables (seat 6)- responsible for a complete change in terms of learning in the classroom, working collaboratively and thinking independently. Suitable for a variety of activities, ‘6 thinking hats’, ‘concept mapping’, ‘venn diagram’- take photos and upload onto Edmodo so students can access their own work and everyone elses. 3 Zones, ‘panic’, ‘stretch’ and ‘comfort’, most SEN students enter lessons in the panic zone and stay there. 4 C’s for Challenge, ‘Collaboration’, ‘Choice’, ‘Competition’ and ‘Crutch’. Differentiation through task, questioning, groupings, teachers and other adults. Warm, hot and scorching tasks. Groupings- Use teams of mixed ability, have clear roles and responsibilities that students explain back to you. Avoid LSA blocking- SEN still need subject specific qs to ensure challenge. ‘There is no one alive more youer than you’ Dr Seuss Creativity and independence should be encouraged in the classroom. Allowing students to be creative allows them tp fail and not be afraid. 2 choices?go open ended or restrict them? Use play doh, useful for showing processes/ change over time, lego, tin foil teamwork, make them think in a different way. 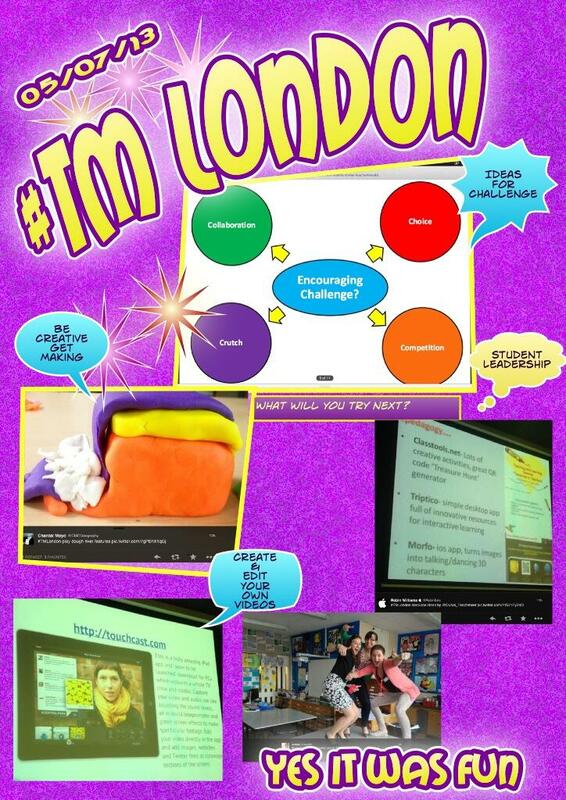 Apps such as skitch and fotobabble- give a choice of how to present information at the end of a topic. Benefits? Safe, free, teachers can give feedback and post grades and parents can view child’s work and grades. On the staff page, library for resources and notifications when students comment or produce work. Summative/formative feedback- set assignments and link to resources and comment on submitted work. 1) What a joy to see so many teachers giving up their free time on a Friday night and hungry for professional development. Hope you’re reading this Gove/Wilshaw! 2) They are great for networking opportunities, was lovely to meet people I’d had contact with on Twitter, Ross McGill @TeacherToolkit, Sapuran Gill @ssgill76, Amjad Ali @ASTsupportAAli, Debbie Light and Mel Aberson @TeacherTweaks in the flesh and spot Martin Burrett @ICTmagic and Jude Enright @judeenright too. Was great to meet Chantal Mayo @CMOGeography also, I have been looking to start a student T&L Blog at my school and partner with a school in the UK, Chantal has offered to link up with us; we have exchanged a few messages; can’t wait to get started on some global blogging! 3) Inspirational ideas a plenty! I learned lots, instant T&L ideas, innovative strategies, exciting IT apps and much discussion of thought provoking topics. I couldn’t sleep that night as my head was buzzing with all the ideas I could take back to school! I made a very weary eyed journey back to Coventry in the morning! 4) They are genuinely good fun! Golden tickets, bring and brag, random photo opportunities and YMCA….Imagine that teachers having fun at CPD..! 5) Oh and did I mention it was all free! !